Inspired: An Improv Blog Impride Workshop! Gender Blender with Betse Green! Impride Workshop! 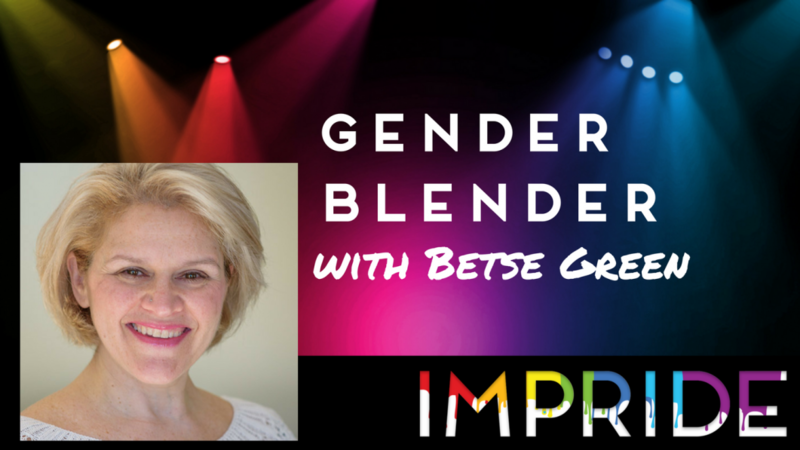 Gender Blender with Betse Green! Gender is a construct: so let’s get constructive! With an emphasis on finding authenticity through subject matter often lost in stereotypes, we will utilize playful exercises to break from the binaries that bind and draw strong, meaningful connections to the gender identities in your life, both in and out of performance. – The value and purpose of walking in a different-identifying gender’s shoes and learn more about yourself. Wear comfortable clothing and be prepared to move your body in different positions. Betse’s workshop will take place Sunday, July 8th at 10:00am. About the Instructor: Betse Green has been a very active member of the Portland Improv scene since 2002. She is an ensemble member of ComedySportz Portland and The Brody Theater. She also performs regularly with Peachy Chicken, B&B, B.A.B.E. and Gladys Kravitz. Her talents have been showcased at festivals across the Globe, including the Chicago Improv Festival, Phoenix Improv Festival, London Slapdash Festival, Stumptown Improv Festival, IFCincy, DCM, Seattle Festival of Improv Theater, Detroit Improv Festival and DC Improv Festival. Betse teaches improv classes at ComedySportz, Curious Comedy Theater and The Brody Theater. In her spare time she is the co-owner and Education Director for ComedySportz Boston. With nearly two decades of improv experience, Betse Green knows a thing or two about “YES; AND…!” while still being able to address barriers both nervously personal and inherently societal. As a player & instructor, she has performed all over North America and the UK. Her curiosity compass points directly toward forming strong, grounded characters, whose honest relationships form the heart of the scene. She likes to play for the others: those people and situations that can otherwise be forgotten on the improv stage, as is apparent in her work with people possessing a wide range of abilities and experience. Her workshops explore a variety of topics-from improv basics, to guiding experienced players through complex territories such as race and gender, and how artists can incite and continue these conversations from the stage. Yet paramount to any ideology is FUN! Betse’s lust for life has made her a staple of the Oregon improv community and continues to propel her imagination and dedication to Portland’s improv stages and beyond.